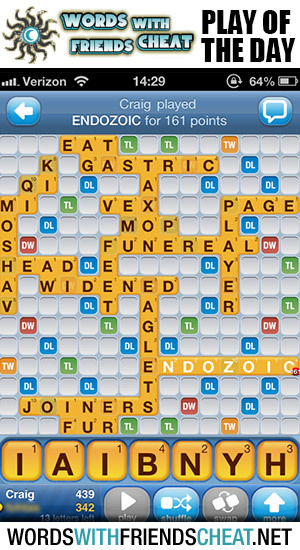 Today’s Words With Friends – Play Of The Day is ENDOZOIC (161pts) and was submitted by Words With Friends Cheat user Craig. Today’s play is rather unusual. This is due to the fact that Craig was able to achieve such a great score without using any of the board’s outside edges. He simply saw his opportunity and went in for the kill, and as you can see, this play helped Craig secure a very healthy lead. His score was achieved using the double word, triple word and triple letter tiles. 1. (of a plant) living within an animal.